The leaves are changing, the air is cool and crisp, and the holidays are nearly here! But if you’re feeling more trepidation than tremendous joy at the arrival of the biggest spending season of the year, you’re not alone. Overspending has become a holiday tradition, with November and December now heralding the arrival of last-minute expenses, busted budgets and mile-long credit card bills. Autumn should be a time for curling up on the couch with a good book and a pumpkin spice latte – not panicking about how you’re going to afford the holiday season. To help you relax and enjoy the run-up to the holidays, here are a few budgeting tips to bring more festivity, and a lot less stress, to the happiest season of the year. This year, get your holiday shopping finished ahead of time so you can hunt out the best deals, rather than paying full price at the last second. Start by budgeting how much you want to spend on each friend or family member, then head online to compare prices, before finally making a purchase. Or, if you prefer to shop local, pop into shops in person to check out the pre-Christmas sales. Stores often try to move merchandise before the holiday season kicks off, so you might find a great deal on summer-themed gifts like gardening supplies, floral clothing or outdoor kids toys. A few small lifestyle changes are all it takes to shave down your spending in anticipation of holiday expenses. To start, avoid eating out as much as possible and cook at home instead. Yes, it can feel like more of a hassle in the already-stressful holiday season, but eating in can literally save you hundreds of dollars every month; balancing out the added expenditures – like festive work drinks or a new piece of knitwear for your neighbor’s ugly Christmas sweater party – that inevitably crop up this time of year. Buying in bulk is a fantastic budgeting trick, especially with winter holidays on their way. A case of prosecco from an outlet grocery store will see you through a full season of festive parties, while a multi-pack of locally made chocolate treats means you’re set for hostess gifts and last-minute secret Santa exchanges. You could even bulk buy gifts with your coworkers – see if anyone has friends or family members who are around the same age or have the same interests, then shop together for special bulk deals on items like toys, gift certificates or homewares. It’s tempting to whip out your credit card around the holidays, but be careful not to accidentally gift yourself with a mountain of debt that will follow you around for the next 12 months. Choose a card with easy to understand terms and a low annual fee. The HUECU Platinum Rewards card might be the right choice if you need a little extra help around the holiday season. It offers no annual fee and a 1.99% intro APR rate on purchases for the first 12 months. Plus, it rewards you with cashback benefits like 3% on gas, 2% on groceries and 1% on everything else – so when the holidays are over, your credit card will keep the spirit of giving alive. This year, make a dedicated effort to reduce your environmental footprint – and your holiday expenditures – by using recycled materials whenever possible. Instead of purchasing roll after roll of gift wrap, use holiday-themed magazine advertisements. Glossy pages of any kind also provide the perfect material for holiday crafts; you can make ornaments for the tree, paper chains to hang around the house or festive centerpieces to display at meals. Crafting your holiday décor means you’re reducing waste, spending less, and gaining a new hobby that’s perfect for keeping busy when it’s gray and rainy outdoors. Get a head start on clearing out clutter for the New Year by stopping all those subscriptions you no longer use. Haven’t listened to an audiobook in six months? End that Audible subscription. No time for Netflix now that you’ve gotten a promotion at work? Cut it out and settle for a few months of network television instead. All of these subscriptions can add up to loads of hidden expenses every month, so if your purse strings are getting tighter and tighter as holidays approach, now is an excellent time to stop paying for subscription services that you don’t really use. Give a gift to future you by starting a Club Savings Account with HUECU. 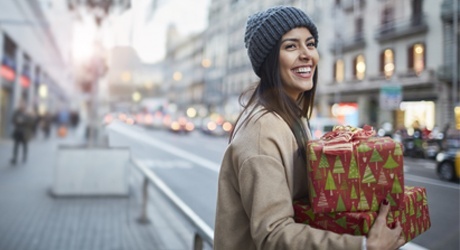 These single-purpose savings accounts help you save for specific expenses, such as next year’s holiday shopping. You can make regular contributions throughout the year via a payroll deduction; then, on a specific date, the funds will automatically be transferred into your HUECU savings account. So, by the time the festive season rolls around next year, you’ll have a pot of money waiting for you and all your holiday budgeting needs.